This deodorant features a drip-free application and moisturising aloe vera, the new unisex spray offers effective and long-lasting protection against body odour. Made from 100% natural ingredients and fragrance-free, this unisex deodorant spray offers long-lasting protection against body odour. No pore suffocation, no white marks on your clothes. Approved by the Vegetarian and Vegan societies. Suitable for ages 6 and up! Does not contain aluminium chlorohydrate, aprabens, triclosan, alcohol or CFCs. Does not suffocate pores. In case of contact wash with copious amounts of water. Below are reviews of Salt of the Earth Spray Deodorant - 100ml by bodykind customers. If you have tried this product we'd love to hear what you think so please leave a review. Brought the spray deodorant and the refill. Already use the solid rock stick, but needed something that was easy to use on dry skin too. 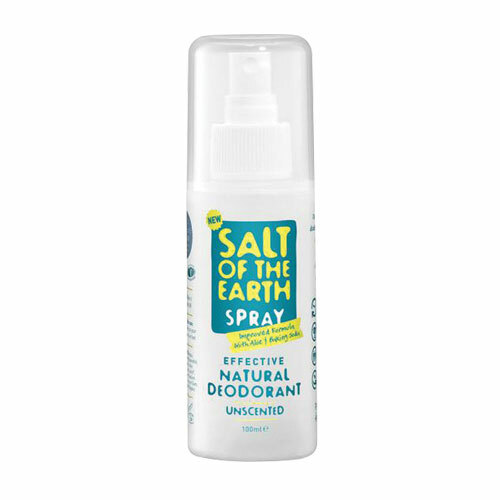 Really pleased with salt of the earth products. Find these natural deodorants really effective, even though I was sceptical. I occasionally top up with a spray application part way through the day if I've been particularly active. Will buy again. I bought this for my son but he finds that he needs to use it twice a day.